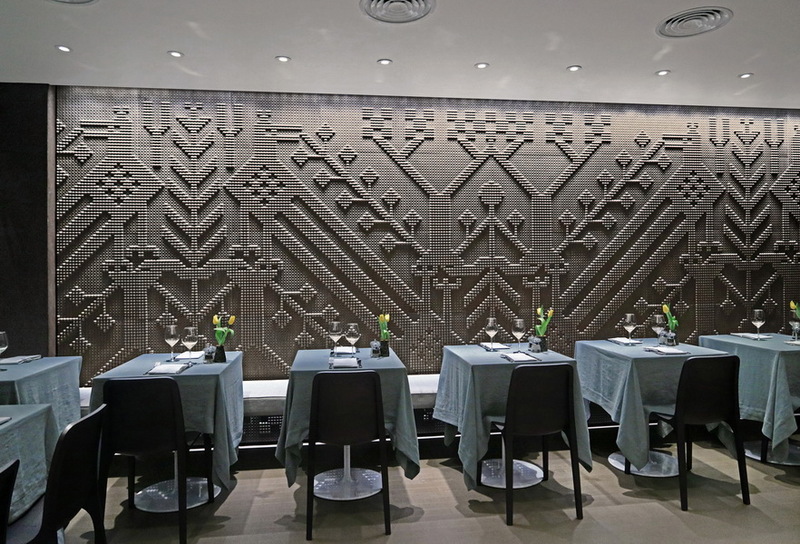 In this new restaurant, refurbished 25 years after he first designed it, the same architect continues telling customers about Sardinia (a narration of the proprietor's home island that he previously began with the same company's other venues), here evoked through wide natural stone bas-reliefs referring to the unmistakable ancient weaving technique named a pibiònes (grained texture), peculiar to that island. The access to the restaurant and the whole building is through a shop front very much respecting the London Victorian tradition in design. The solid wall which previously divided the entrance lobby from the dining room facing the street has now been removed and replaced by a full height fire resistant glazed divider, so as to give a more visual opening and greater breadth to an otherwise overly compressed space. 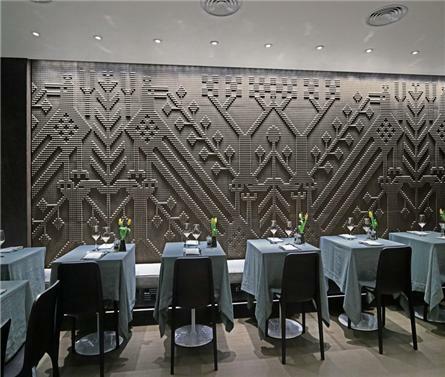 At the end of the small entrance lobby the restaurant door and the one giving access to the staircase leading to private upper floors, combined in their respective open and closed position, form an unitary full height panel veneered with dark brown stained oak unmistakably directing visitors towards the main dining room, the primary feature of which is a first wide wall "tapestry" made out of natural stone (finely chiselled by LITHEA’stone art masters according to the architect's design), inspired by typical Sardinian fabrics where decorative patterns (among which the lapwing bird, here reproduced seen in that island as a symbol of fertility and prosperity, is one of the most recurring ones) are enhanced by a sort of grain in relief (pibiònes) generated by sequences of small loops executed with the weft thread. 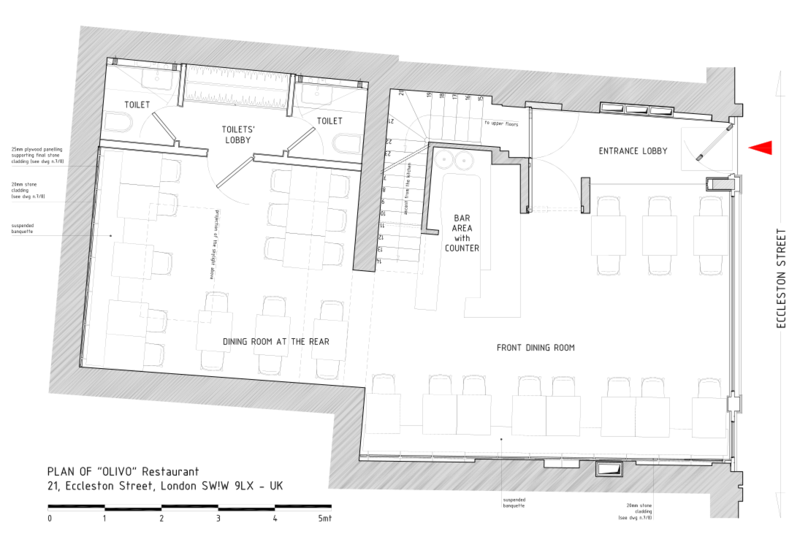 On the right side as one enters is the bar/reception unit, consisting of a multifunctional counter completely made out of "coffee-bean" brown Corian?, behind which, in between the dining rooms at the front and at the rear, is the access to the staircase leading to the kitchen located in the basement. Opposite to the access to the inner dining room, is a second stone "tapestry" covering the whole far wall and featuring a new pattern, once again based on the iconography of the lapwing bird. On the right side a full height door veneered with dark brown stained oak, opens on a tiny lobby giving access to the toilets, where the mirrored door panels of the wardrobe cabinet provide the illusion of a deeper space. All the premises walls are covered with a matt wax finished blend of resin and cement finely grained, coloured in the warm and dark shades of dove grey and burnt coffee which, while producing an effect of diffuse semi-darkness, give prominence to the sepia colour bas-reliefs lit by a vivid grazing light and enhance the unusual “duck egg” colour of the genuine linen tablecloths, also featured in the colour of the shop front and harmonizing with the wood floor finished with a special hardwearing coating paint.